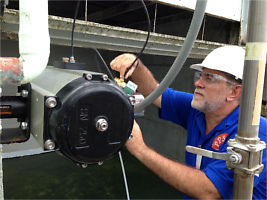 We assess your needs for a single or dual loop systems and provide recommendations on sensors/transmitters, final control element and installations. 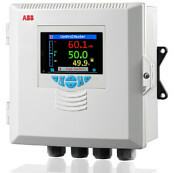 Controllers can be field mounted stand alone or connected to your DCS or PLC. Local indicators, data recorders and other options are available based on application needs. PPS calibrates every automated valve that goes out of our shop, weather it is an on-off or modulating assembly. We follow a 12-step calibration process that confirms details from your order with the assembly been tested. These details include materials of construction, end connection, pressure class, Tag number confirmation, cycle speed, electrical classification of switches & solenoids, switch orientation, continuity, voltage & Bus communication if applies. Pressure tests are available with air or water. A certificate of calibration is available. 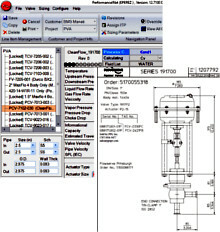 PPS uses sizing software to determine Cv required for new process valves. Utilizing customer provided process conditions PPS in turn provides a program generated data sheet with Cv required and details pertaining to the application. For existing valves that need actuation we can size up torque or thrust requirements and offer a complete automated package including actuator, mounting kits, limit switches, solenoids or positioners. Utilizing Alfa Laval’s CAS software PPS can provide a pump recommendation based on flow conditions for centrifugal or positive displacement pumps. Recommendations can be made based on efficiency, NPSH required, horse power or total cost. Resistoflex lined pipe spools come in 10 and 20 feet lengths. During installations custom length spool can be manufactured by PPS with greater speed and flexibility than at the project site. PPS can fabricate lined spools based on customer ISO drawings and deliver them marked by ISO & item number facilitating logistics for the mechanical contractor. Deliveries to the project site can then be coordinated by ISO in order of project priorities. Talk to us on your lined spools needs and you can pass the spool fabrication, warehousing & delivery worries to us! PPS proudly represents T-Tubes insulation. T-Tubes are an advanced insulation system specifically developed for process lines in clean environments. They come with a flexible extruded jacket and have a temperature range of -80° to 160°C (-112°F to 320°F). With a wall thickness of 1/4” (6.35mm) they save space and allow for insulating areas that cannot be covered using existing products. Installation is easy and fast with custom molded fittings and overlapping self-adhering tape. 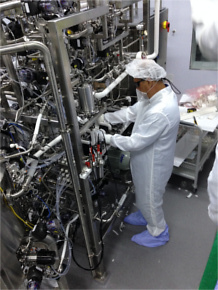 PPS team has installed T-Tubes in pharmaceuticals, Dairies, brewing and Biotechnology plants. The benefits are obvious, radical thinner walls, closed cell material and fast/easy installation that eliminates costly external contractors. Also T-Tubes insulation is removable for inspection of lines and can be shaped for filter, heat exchangers and other pieces of equipment with a quick removable system!